Tracey Kumer-Moore, JWIC, Your Las Vegas Wedding Concierge & our Chapter Secretary, has been published on Style Me Pretty! "Your Vegas Wedding Style is Showing" is now officially up to read! Please follow the links and show your support for Tracey, as we are all very excited for her and it's a great article. Style Me Pretty is considered one of the leading wedding blogs for brides today to see great stylish ideas and real weddings with great photo editorials. The Little Black Book Blog is a blog that features weddings and articles exclusively from the Style Me Pretty exclusive "Little Black Book" of selected wedding professional advertising partners who are pre-screened & limited to 3/category. 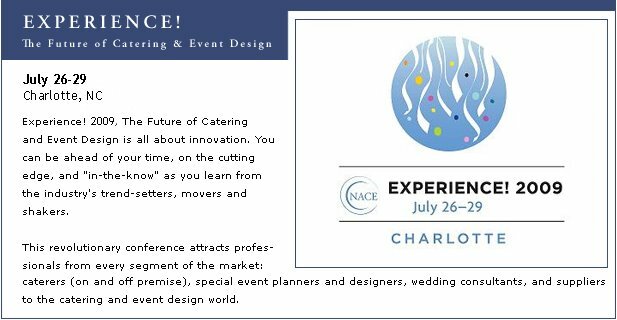 The Las Vegas chapter of NACE (National Association of Catering Executives) is a multi-award winning chapter and one of the association's largest and most active with it's members representing the most talented caterers and event professionals and the very best of Las Vegas, the USA and the World. Visit our website for more information. The Hallmark of Catering Excellence! Interested in Being Among the Best? Click Logo. Who is Reading Our Blog? The Best of Catering, Food & Beverage Served to You! Save the Date for "Experience 2009"!